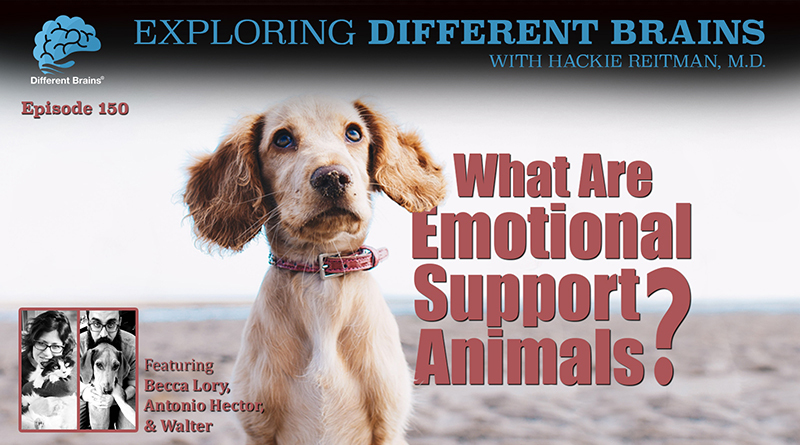 In this episode, Dr. Hackie Reitman speaks with Becca Lory, CAS, BCCS, Antonio Hector, and Walter the Emotional Support Animal! HACKIE REITMAN, M.D. (HR): Hi, I’m Dr. Hackie Reitman and welcome to another episode of Exploring Different Brains and today we’re going to have three for the price of one. We’re interviewing three. We’re interviewing Becca Lory who’s a board member of Different Brains. She is autistic; she’s wonderful; she’s ten times smarter than me, and she’s going to tell you about all the other stuff she’s doing which is considerable. Then we have Walter the Wonder Dog, who’s the support dog who takes care of Becca, but also Becca’s partner Antonio Hector who’s here, what kind of runs a lot of the business ends of things and everything and welcome Becca, Walter, and Antonio. BECCA LORY, CAS, BCCS (BL): Hi. HR: Thank you for all three of you for being here and I know that Walter tends to talk a lot but we’ll try to keep him under control if you could. ANTONIO HECTOR (AH): We’ll try. HR: Can each of you please introduce yourselves? BL: Sure. Hi, I’m Becca. I’m a board member of Different Brains as Hackie mentioned. I’m also an autistic advocate and autism consultant. I am a podcaster, a blogger, writer, and I’m also the director of communications at the Center for Neurodiversity. HR: And the co-host of Spectrumly Speaking, the female-oriented podcast Different Brains does. That we’re so lucky to have you and Dr. Kate Cody doing it. Thank you. Walter, you’re up. BL: What do you want to tell everybody? Walter is a certified shelter dog. We adopted him and rescued him as a pup and we kind of figured he was pretty special when we met him, but I wanted to see what he could do. We sort of began training him, and he worked out to be a pretty fantastic emotional support dog. He’s been trained pretty thoroughly and could take tests for service and therapy, but he’s still an emotional support dog, since that’s what he does for me. HR: Antonio Hector, you’re up. AH: My name’s Antonio. Like you said, I do most of the office work, traveling plans, and everything for Becca and I when we go to conferences. I also work as the director of IT and media at the Center for Neurodiversity as well as training Walter and handling him when we go out to the functions. HR: That’s great. That’s great. Now and you two recently got married. Is that a true statement? HR: Congratulations. Was Walter the best man? BL: No. Well, he and Peggy were both there. They were there as witnesses more than anything else. HR: Oh, okay, alright. Explain to our audience what an emotional support animal is and why it’s different from a service animal. BL: Okay well we can talk about it a few different ways, but I think the way that makes the most sense for me is the way that I kind of see it, so when we talk about service and please interrupt because you know the rules better than I do, so if I say something wrong, please correct me, but service animals are task trained, so they are trained specifically to do a task replacement for somebody, so we often see them with people with physical disabilities because they can replace the behavior, the task that that person is needing to do. Therapy dogs are also trained, but they’re trained slightly differently. They’re not trained necessarily on tasks so much as they’re trained on their behavior and on protocols for their behavior. Mostly they’re really easygoing dogs that can provide some kind of comfort in a therapy setting. So what people mostly misunderstand about that is that a therapy dog isn’t working all the time. A therapy dog is only a therapy dog when he’s with his handler and working with a patient. So if it’s not a three-way situation, it’s not a therapy situation and that dog is just being a dog. An emotional support is a dog that lives with you like a support animal. He’s with me all the time, and the biggest difference between what he does for me and what a service dog does is that it is not exactly task training. I’m working with him and trying to make some tasks that I can quantify as task training, but most of what he does is really just dog behavior and its really good dog behavior that he does in tune with me for what my needs are. So in that case he’s working 24 hours a day 7 days a week. So if I reduced him to a therapy dog status, that would mean that all the time he’s working with me, he wouldn’t be really working with me officially, so we decided to leave him as emotional support because I think that emotional support animals and companion animals play a really big role in our mental health on the spectrum, off the spectrum, just as human beings, so I think to discredit those categories is unfair. HR: What kind of certification does one need to obtain an emotional support animal? BL: The certification for emotional support is all on the human. That’s whether the human is qualified to have an emotional support animal. There’s no testing or certification for the dog per se, an emotional support animal, because it doesn’t have to be a dog. It can be lots of other animals. HR: But what about what about the individual, like what kind of certification do you need as an individual. BL: I need technically by law, is a letter from my therapist that I have to be currently seeing, and that therapist has to write a letter saying that I do need a emotional support animal for the reason that they list in the letter, for me that’s my autism and my social anxiety, and then they signed with their professional license. They have to be within a, signed within a year, which means that you the human have to be in active therapy in order to have your emotional support animal. HR: What’s the biggest misunderstanding people have about support animals? BL: I think the biggest misconception the one that we run into I think the most is that we’re pretending to have a service dog, and somehow trying to get over on the rules and take Walter places that he’s not supposed to go, and that he’s untrained, and there’s a lot of myths behind emotional support, that anyone can have one so therefore all of them are bad. And so what I run into is a lot of prejudice because he’s not a service animal, and he’s an emotional support animal, and it’s usually from people with service animals that give me that prejudice, so it’s interesting that, not so easy, but that’s the biggest problem. HR: Do you have any opinions about the recent controversies allowing service and support animals into businesses and on planes? Antonio I’m going to let you take that one. AH: I think one of the biggest concerns is that because emotional support animals do not require any specific training, they can be rowdy if the owner doesn’t keep up with just basic skills with that animal at home and constantly enforcing it, that animal can get overwhelmed in a situation such as in a supermarket or something like that, and they can start to act out. A service dog goes through rigorous training for two years at least and should continue that trading with their handler. Therefore, they’re put in those situations, they’re taken constantly to supermarkets, department stores, and we do something similar with Walter. We take him to places like Home Depot where they allow us, our old Target would allow us to take him in there without anything just to do training stuff, when we did take him to the airport so he would be accustomed to all the people. So that is going to be the biggest issue I find that you allow just general emotional support animals into businesses they get rowdy. If we start requiring training for these animals that would be a different story. Which should be something that should be done. BL: Because we don’t have the regulation people that are doing it right are also paying the price for the people that are doing it wrong, if that makes any sense. HR: Okay well it does. Is there anything we haven’t covered about support animals that you like to cover today? BL: I think the reason, I’m very glad that you had it on to talk about it, because I think the reason that I’m so visual with Walter, the reason I bring him out and I do interviews with him and I take him to my speaking engagements is because I want the other people on the spectrum to know that using your animal as a tool, having your animal as a support, making them part of your routine is a pretty healthy thing for us on the spectrum, so your companion animal can do that for you. 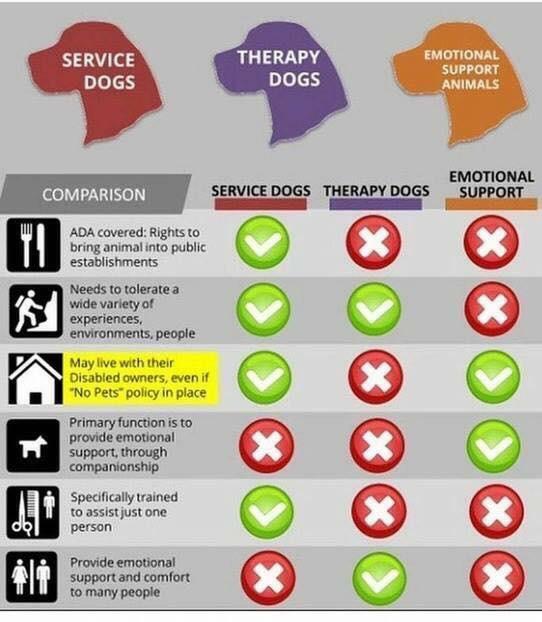 You don’t have to have a service animal, don’t have to make the leap all the way to having a service dog, but doing a little bit of training and work with your animals can get them in shape to be an emotional support animal, which seems to be the place that those of us on the spectrum really need them the most. It’s not so much for the task replacement as much as it is for the grounding and so spectrumites I say to you think about it and think about how important your animal is to you and your life and if you can be developing that relationship to help you be supported. HR: Now very importantly can you comment on Walter’s socks? BL: Yes, Walter’s socks. So there was a little fad for a bit about putting your dog on socks on the internet. And so I decided that that we should go ahead and put Walter’s adorable face on a pair of socks with his Instagram handle which is @SirWalterUnderfoot and see if we couldn’t raise some money for the Denver Animal Shelter because I think that we’re not really giving the shelter animals the chance to be true companions in our lives. And so since Walter came from a shelter, we thought we’d raise some money to support the shelter back. You guys can pick up your Walter socks if you want to on my website at beccalory.com, and at the end we’ll be donating some of the proceeds to the Denver Animal Shelter. HR: How can our viewers learn more about emotional support animals and service animals? BL: I would say if people are looking for information on emotional support animals, doing a quick Google search is good, but what I want to warn people about now is there’s sort of them, a wave of people that are charging an awful lot of money to send you an autism support dog, and I’m not sure that really exists. So my biggest thing is when you’re looking for an emotional support animal or you’re looking for a service animal or a therapy animal, try to be wary of where you’re getting your information from. Try to remember there aren’t very great rules right now. There’s not good regulation. There’s not good rules about anything so you’re going to be seeing a lot of mixed information and the best thing to do is to find kind of a kennel organization, usually the shelters, they will usually have a little bullet that describes you the three conditions and what they’re allowed to do but be careful when you’re spending money. So if somebody’s asking you for money for these things, be careful what you’re spending money on. As everyone with autism is different, it’s really hard to pre-train a dog for someone with autism. HR: How do our viewers get a hold of you guys, to ask you more questions and just see what you’re up to? Is that beccalory.com? BL: You can follow Walter on Instagram if you want to. He’s @SirWalterUnderfoot and you can find me on LinkedIn and Facebook, and I also do a neurodiversity newsstand group on Facebook, which is a positive newsgroup about neurodiversity. We stay pretty positive, so that’s another way you can find me. But I think the easiest if you have a specific question would be to go to my website beccalori.com. On my contact page there’s a nice little form you can fill out and you can ask me whatever question you want and the email comes right to me. HR: That will be great and I want to tell our audience that we’re gonna have a separate interview with you on the non-animal issues of being a woman on the spectrum and doing all that you’re doing which we want to thank you for. You’re doing so many great things, obviously not just for DifferentBrains.org but for all the different organizations for so many people and you probably couldn’t do it without Antonio Hector over there helping you out and without Walter so it’s a team effort. BL: Absolutely. I could not do it alone. I don’t think any human being does anything alone so I absolutely couldn’t. HR: Thank you very much for being with us here at DifferentBrains.org for another episode of Exploring Different Brains. Thank you. 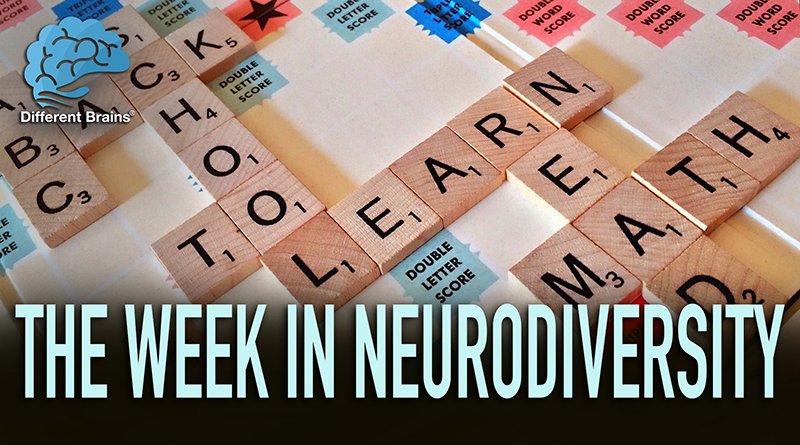 (3 min 31 sec) In this episode: a boy with dyslexia starts a “reading for dogs program,” young adults with Down syndrome are empowered through photography, a boy with autism develops a passion for scrabble, and more! 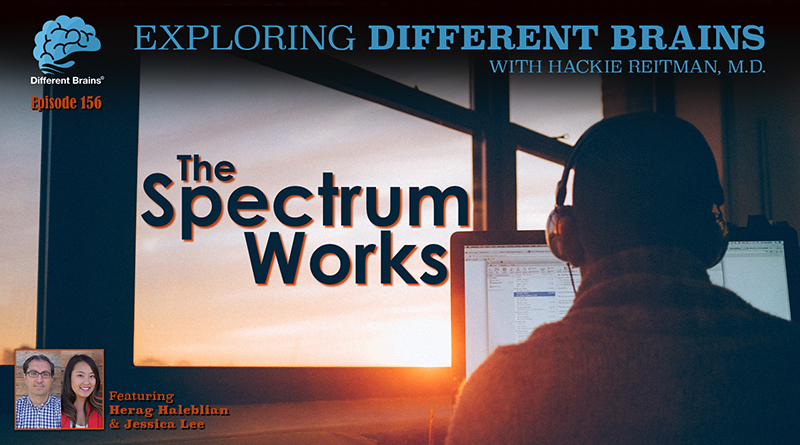 (22 mins) In this episode, Dr. Hackie Reitman speaks with Herag Haleblian and Jessica Lee, co-founders of The Spectrum Works - and organization dedicated to helping people with autism find employment. 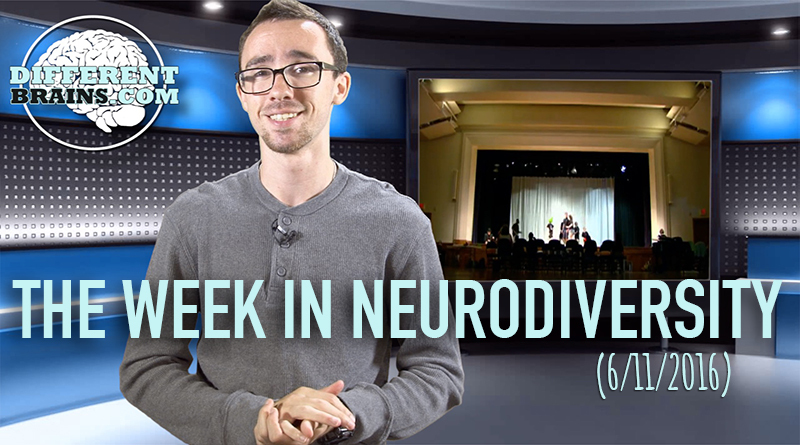 In this episode, a study shows drama classes help those with autism, a town is colored purple for Alzheimer’s Awareness Month, and how did one man gain control of his Parkinson’s?